I have, generally, done a very poor job resisting the pull of smaller and smaller keyboards. I really like mechanical keyboards, and I truly think that the Vortex Pok3er platform is amazing. The rabbit hole gets deep, I’ve added custom GMK Carbon SA keycaps (about $180), a matching short braided USB cable ($20), a walnut wood case with wrist rest integrated ($50). Yeah, it gets expensive. But I really care about my keyboard, and the above is to illustrate just how much. A keyboard is my primary interface to my computing world, and more than that, you could argue it is how I make a living. It is the one thing I spend the most time at during the day, so it should be something I like, and which works well. All of that is to explain why I keep trying 40% keyboards, or keyboards without even a number row at the top of them. My hope is to find something nearly as good as I have on my desk, which I can also take with me when I am out and about. It will never be as convenient as a Smart Keyboard Cover, but the big question has always been: could the trade off be worth it? 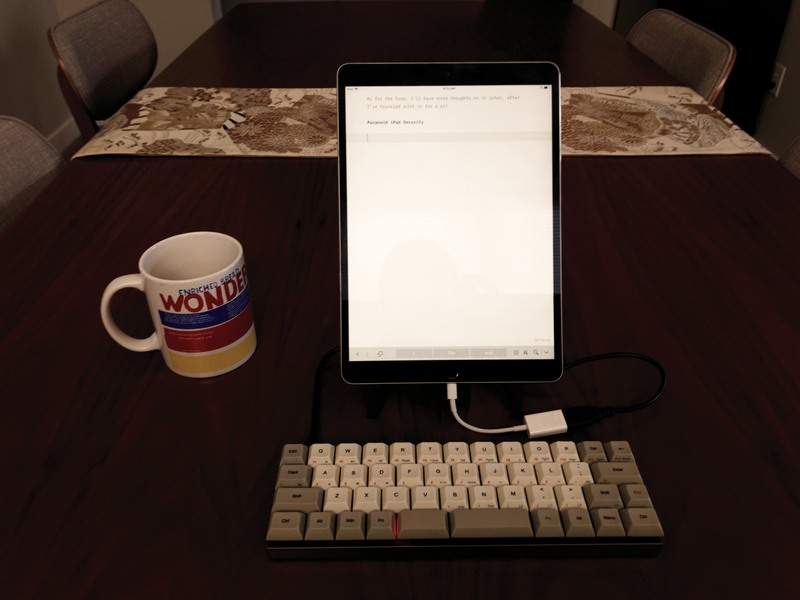 I last tried the famed MiniVan keyboard, and hated it. So this should be an adventure. 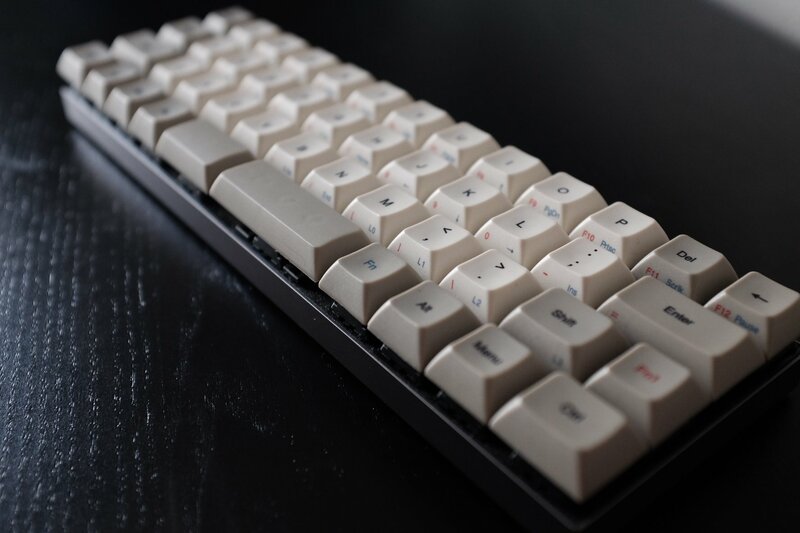 Vortex’s Core is their offering for a 40% keyboard, and given my love for the Pok3er and the absurdly low price of just about $100-120 for this, I knew I needed to try it. In typical Vortex fashion, the keyboard is well thought out, with programmable layers on top of a default layer. The benefit to this is that you always have something to fallback on, with the markings of what is where, on the edge of the keycaps. The downside is that you have to almost always be working on a layer if you are a Mac user. Unlike most 40% keyboards I have seen and tried, this one has easily the most sensible layout out of the box, and one of the overall smallest footprints. 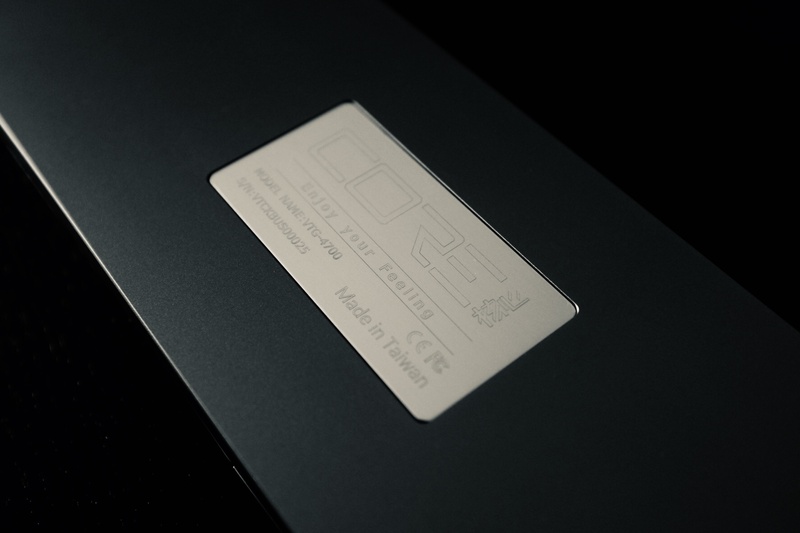 The keycaps too are shallow enough that they are equally low profile. The entire package screams to be taken with you. What completely sank the MiniVan for me was the programming. Since it is a fully custom board, the programming is whatever you want it to be, and thus, the keycaps had no markings beyond the standard ones. This looks stellar, but in practice it was maddening to use. I literally had no idea where even the numerals were, which led me to often writing out “one” when I was talking with people. What was the deal breaker for the MiniVan is essentially a non-issue. No matter what you try, if you want a keyboard this small, you have to learn it. But the difference here is that the Core aids in learning, and recall by having proper markings on the keycaps edges. The downside to all this: it would be foolhardy to replace the keycaps, which takes a bit of fun out of it all. Perfect. Any angle or direction you look at this, and you get the real sense that there’s no possible way you could have made this keyboard smaller, and still made it useable. It is as small as it can be. It’s also just heavy enough to be solid on the desk, but still light enough that you don’t feel crazy for carrying it with you. Fantastic all around. It’s nearly useless on a plane. I already have a hard enough time typing on a plane, but this doesn’t help at all, and makes things much more cumbersome. That also goes for any time when you might want to type in your lap. 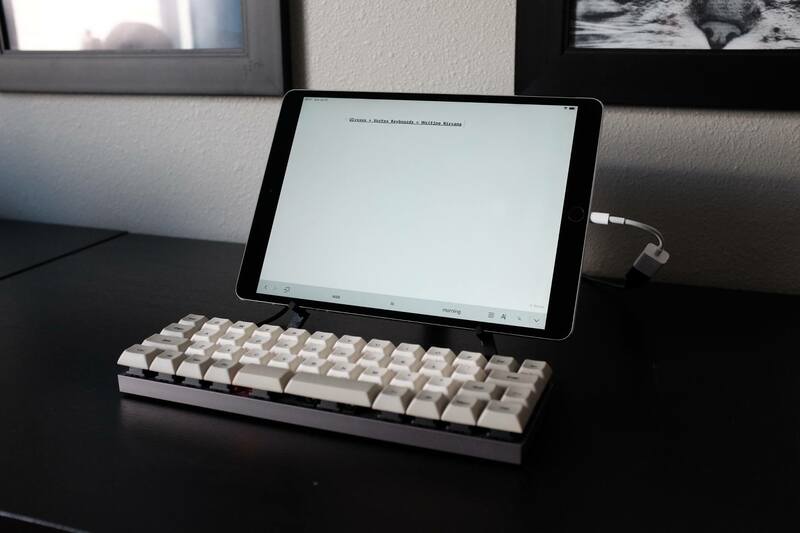 You can get away with it using a Smart Keyboard, but because this keyboard means you need a stand for the iPad, it is simply not worth the effort. This means I reverted to the software keyboard a lot for these scenarios. Setup can be a pain. You need a cable, a dongle, space, and then a stand. But it types so nice. I really enjoy it once everything is actually set up. I am almost always annoyed setting it up, but quickly forget once I start going. You need a case or a sleeve for it. Even carefully placed in different bags, the keyboard tended to have some keys on the edges pop off. There’s a whole world of aftermarket keyboard covers for me to explore now. In general I feel incredible silly pulling this out when I travel, but once I start to type on it, I remember why I do it. It’s worth it to me, but not likely to many others. It also changes how I work quite a bit on the road. I tend to have fewer sessions sitting down to work, but those sessions are longer and more focused. Since the setup is more involved, I take it more seriously and squeeze everything I can out of it. I also tend to use the software keyboard a lot more, which is not as bad as I thought. But then again, this opens another can of worms about iPad sizing. As a travel keyboard, this is passable. What I am truly missing is a good stand, for now I am using my first generation 12South Compass, but really need something better. Something like the Studio Neat sleeve for this keyboard would be stellar. 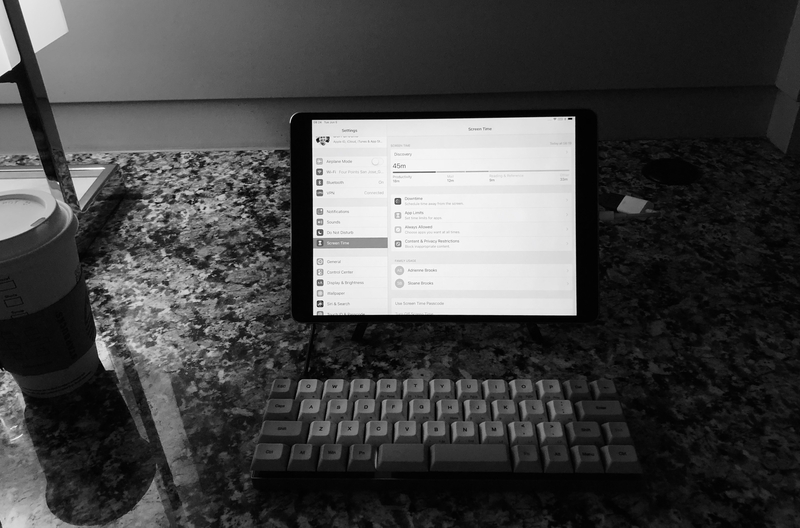 However, I really like this keyboard and strongly recommend it. In no way does it replace my Pok3r, but in every way is it fantastic. 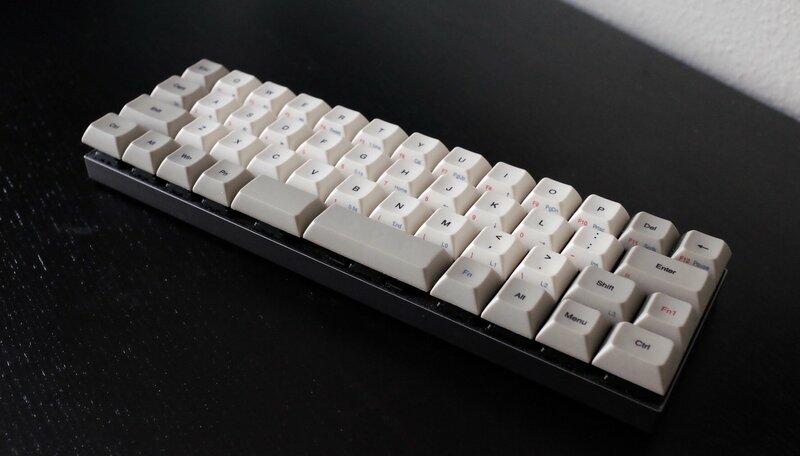 If you’ve been eyeing a 40% Keyboard, this is the one to get. For me, I don’t always travel with it, but when I know I’ll have time to write, I always take it with me. 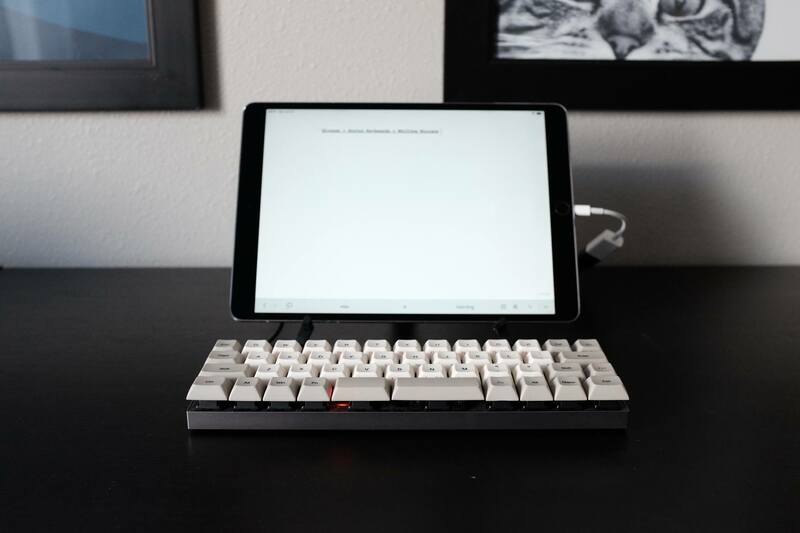 When I think I won’t be writing much, then I go with my Smart Keyboard Cover and call it good. If I find a better stand solution, that could and should change. This was my first go with Cherry MX Black switches which are quite a bit different than the other switches I’ve tried. I’ll spare you the boring technical reasons why, but I really like them. Not enough to switch from Clears, but I do believe they offer a better solution for those who feel Clears are a touch too loud, without sacrificing key feel. They are still not quite, but I think they remove the annoying click that people are bothered by when working near a mechanical keyboard. Which is a huge benefit when you are trying to use one in Starbucks.